Microsoft allows you to install and use Windows Vista for evaluation without license or product key for up to 30 days. Within these 30 days, you must activate the Vista system with a valid product key. Else, if you forget to activate your computer, or you’re using illegal and pirated product key, Windows Vista will go into Reduced Functionality Mode (RFM), where you basically can no longer use the system for productivity works until you successfully activate Vista with a licensed product key. If you’re still not yet ready to activate your copy of Windows Vista and want to further extend the activation period another 30 days, and also want to exit or recover from Reduced Functionality Mode so that you can continue using Vista without reinstalling, here’s a simple hack to crack the RFM. The trick is made possible by Microsoft which still allow users to use Internet Explorer in RFM (probably do so so that you will can buy a license online), which can be used to break out of Reduced Functionality mode by running an explorer interface to open an administrative level command prompt and run the commands required to reset your activation period and recover use of your computer and desktop. On the Windows Activation – Activate Windows Now screen shown above, click on Access your computer with reduced functionality option. Once the Internet Explorer loads, click on File on menu bar and then select Open on the pull-down menu. On the Open dialog window, type in C:\Windows\Explorer.exe and then click OK.
Click OK button on “IE needs to open a new window to open this webpage” confirmation prompt. 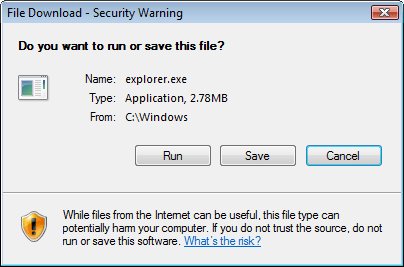 Click Run button on “File Download – Security Warning” dialog prompt. Click on Run button on “File Download – Security Warning” warning dialog related to unknown and not verified publisher. User shell will load, and the desktop, Taskbar, start menu and etc will be restored. The computer has recovered from Reduced Functionality for this session. To permanently stop RFM to happen again, rearm Windows Vista. Type Cmd in Start Search box. A program shortcut will show up in the Start panel search results. Right click on the shortcut and select Run as Administrator.